This Tuesday on SuperPhillip Central brings to you and me a new retro review. 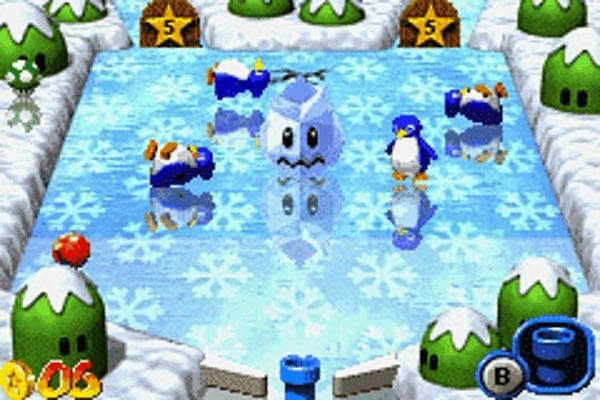 Mario Pinball Land recently released on the Wii U Virtual Console marketplace, so how about we take a look at how competent a pinball game Mario Pinball Land is? Well, actually, the review tagline sort of spoils that answer immediately... Nonetheless, here's the review! stops is a mediocre pinball game. Mario is indeed a versatile character. He never shies away from leaving his comfortable platforming roles for rounds of golf, tennis, kart racing, and even an occasional Olympic outing. Most of the time these excursions from the norm are of tremendous quality and execution. Other times, you get what Mario Pinball Land is. While its beauty is apparent, a major design issue holds it back from being another game to add to Mario's greatest hits list. The first thing you'll probably notice when playing or, even less, just viewing Mario Pinball Land is its remarkable production values. This is one of the Game Boy Advance's most graphically impressive games, having everything essentially being modeled to look 3D. You get a grand combination of animated sprites that are as fluid as water as well as a lovely rendered backgrounds that make for a game that looks marvelous on the GBA's small screen. It's really commendable what Fuse Games and Nintendo were able to do with the Game Boy Advance's relatively weak hardware. Mario is a character who has been thrown into all sorts of wacky situations and predicaments in order to make a game out of them. This time, Mario has been turned into a ball and is tasked with once again rescuing Princess Peach from the clutches of the tyrannical Bowser. While it's somewhat irritating to see Mario plopped into another game so clumsily (seriously, wouldn't Kirby who is already basically a ball work better for this kind of game? ), it somewhat makes sense when you understand that Mario Pinball Land is basically Super Mario 64's progression turned into a pinball game. telling the modest tale of Mario Pinball Land. What I mean by this is that the goal of the game is to direct Mario across multiple pinball tables, collecting Power Stars to journey to other areas and make it one step, er.... roll, closer to his battle with Bowser to rescue Princess Peach. Each pinball table is one screen long and has Mario completing some kind of task to acquire a Power Star, whether it's defeating all of the enemies within the screen or... well, actually, that's usually the only task you really have to do in Mario Pinball Land, at least early on. Progressing through the game towards its later stages opens up more mysterious challenges that are quite clever in design and are more advanced than smacking every enemy in the room with Mario in ball-form. 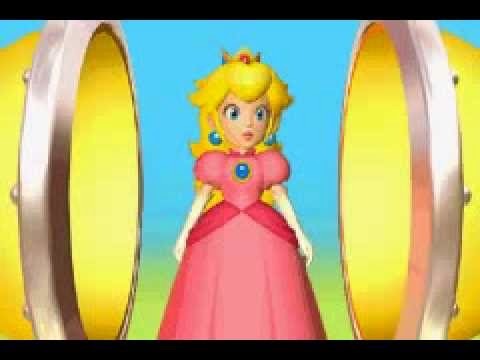 These Power Stars allow Mario access into differently numbered doors, each displaying how many stars are needed for entry. is going to be none too pleased with Mario. 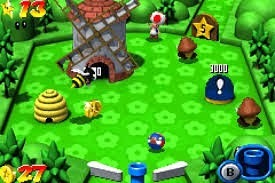 Traversal through the game's five lands is performed with cannons, just like the ones that the Pink Bob-ombs in Super Mario 64 gave Mario clearance to use. 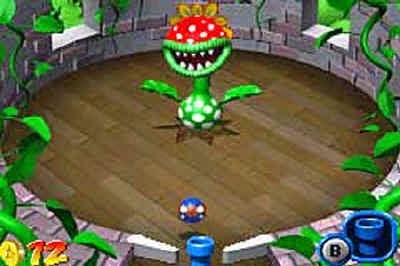 The goal of each land aside from the fifth one where Bowser's domain lies, is to find each land's boss, be it Petey Piranha, a big Boo, or a King Tut version of a Koopa Troopa, defeat the boss, and acquire that land's key. Acquiring all four keys leads the way to Bowser. 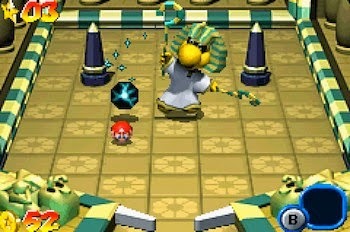 The lands have other challenges aside from collecting Power Stars, such as nabbing eight red coins within a time limit, as well as a multiball feature that has Mario and a cavalcade of Yoshi eggs bouncing along, allowing for significant point boosts. Each land is made up of multiple pinball tables, again just one screen long for each. The variety of obstacles and enemies on each table is varied enough and well designed. However, in Mario Pinball Land, the tables aren't designed to slow Mario down. 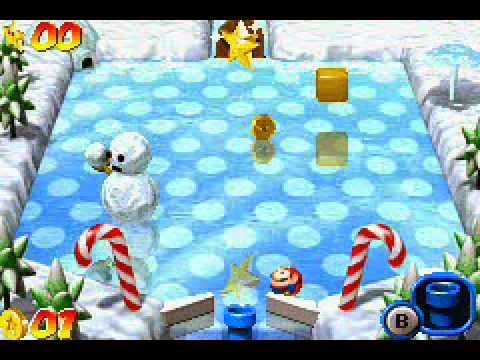 Most tables house large areas of expanse with no objects to give Mario any kind of deceleration, making it quite challenging occasionally to use the flippers to hit Mario with any sort of accuracy. 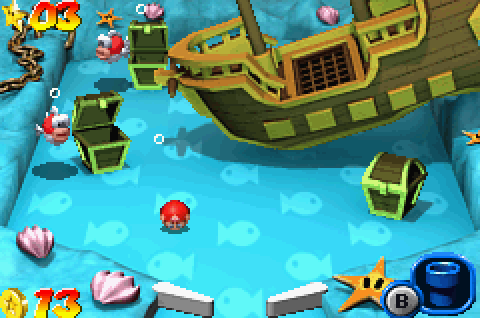 Ball Mario plunders the deep for Power Star treasure. This problem persists in many of the tables, and it's made exponentially aggravating because each time you leave a screen of the game it resets to how it was when you originally entered it. Did you defeat four out of five really annoying enemies only to accidentally enter a door leading to a new area? Well, when you come back to that room, all five of those really annoying foes will be back for you to get irritated with all over again. Enjoy! generation, Petey Piranha is back once again. Perhaps it's a matter of not having enough memory to save the progress of each room, making the game reset how they were originally when you left them. Regardless, all I know is that this makes Mario Pinball Land an artificially longer game than it should be. Considering how easy it is to exit a room through one of the myriad doors because of an ill-timed snap of the flippers or even worse, a completely random and awkward bounce, Mario Pinball Land crosses over from being a fun experiment into a total chore quite easily and quite often. a much deserved Power Star. This is immensely unfortunate, as the promise of having a Super Mario 64 adventure-style pinball game is soiled by this severe omission. 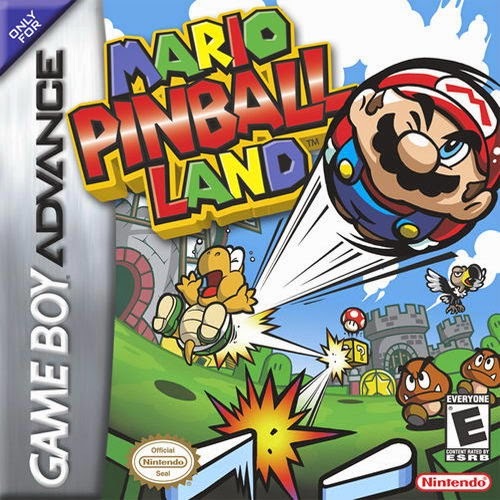 If you don't mind repeated attempts and retries of the same areas over and over and over again, then you might not mind Mario Pinball Land as much as I. Mario Pinball Land could have been an extraordinary pinball title, but minor and major issues with the game's design make it difficult to play as well as to recommend.